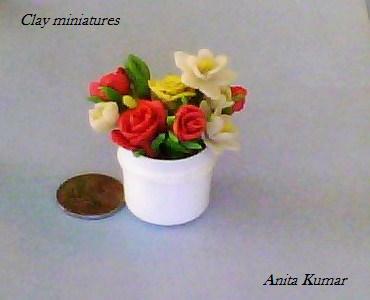 This is a mixed bunch of miniature flowers which I made recently . There are roses, daffodils, tulips and some leaves . Its fun to make miniature flowers as a ball of clay goes a long way ! The container is a small jar of hand cream which they give as samples . Serves the purpose of a small vase quite well ! Its easy to find small bottle caps , tiny jars which can double up as vases for tiny flowers around the house itself.